QUESTION: I HAVE BLOOD SUGAR LEVEL 98 D HOUR PP. I BECAME UNCONSCIOUS WHILE DRIVING SCOOTER YESTERDAY . What happened to you is a quick lowering of blood sugar below 98 (I think it was lower than 50). If you are a diabetic, the quick lowering of blood glucose is very dangerous because can put a patient at risk (the same thing that happened to you). - have your meals regularly to avoid the sudden oscillation of blood sugar (hyper or hypoglycemia). - watch the dose of the diabetic medications you are taking. You should register your blood sugar results and present to your doctor, and let him know what is happening to your glucose levels in order to see if you need changes in the dose of drug you are taking. - Keep a sweet or candy with you in order to avoid losing consciousness again. 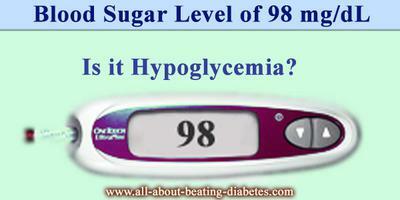 You should train yourself and understand the symptoms of hypoglycemia, in order to take that sweet in time. - Heavy exercises or tiredness, or psychological stress can affect blood glucose. Therefore, you should know how to cope with them correctly to avoid them to suddenly drop down. - Ask your doctor what precautions you should take while driving (scooter, car, etc). That will avoid problems. - Take a bracelet or any card with the sign diabetes or diabetic, in order to let know other people (medical or non-medical) to give you the right assistance in time. Hope it helped. All the best! QUESTION: Diagnosed because of eye problems, retinopathy, giant cell arteritis, polymyalgia rheumatica. Hard to control blood sugar, injecting 4 times a day. not moaning, just wonder why levels are still rising after insulin and not eating. thanks a mill, I'm 60 yr.,old. From your telling, I think your case is a bit complicated. However, I should have some data before giving an exact answer. So, you are saying that you have polymyalgia rheumatica (PR). I want to know if you are taking any medication for this condition. Why? Because, usually polymyalgia rheumatica is treated by using corticosteroids. One of the side effects of these drugs is diabetes. Therefore, if you are taking any corticosteroids to control your PR, this can explain why you are not able to control your diabetes although you are injecting insulin 4 times a day and not eating. You can discuss this with your doctor to see what the right steps to follow are in order to control diabetes and get PR treated at the same time. Keep in mind that your AGE is also another factor that can contribute in an uncontrollable diabetes. If this is the case, you should be patient and follow the right lifestyle and diet changes to get your results soon. Keep in mind that there exist many factors contributing in diabetes onset. 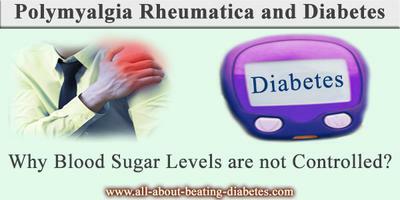 Once you recognize that factor, and try to eliminate, your blood sugar will be back to normal again. Hope my suggestions helped! Talk to your doctor and wish you will get some answer! 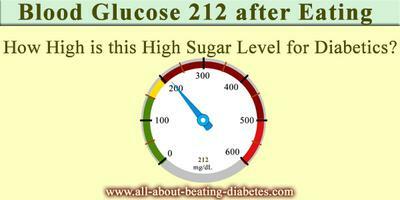 QUESTION: what does a blood glucose level after eating of 212 mean? is that high for diabetes? Normally, there is an elevation in the blood glucose level after eating. For that reason, there exists a precise schedule for the blood glucose values before and after eating. For example, if you get up at 7:30, your glucose level is going to in normal ranges 70-100mg/dl. If you eat something at 8:00, normally, your glucose will rise to values of 200-250mg/dl in a period of 2 hours after having a meal. Of course, there are individual differences in these values and lot of test which have to be estimated in purpose to confirm or reject diabetes as diagnosis. As you probably know, there are a lot of hormones which are controlling the amount of blood sugar in plasma. 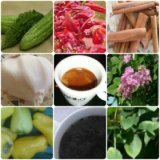 Therefore, when you blood glucose level is low, certain hormones like glucagon and adrenalin are increasing it by stimulating the hydrolysis of glycogen (polymer of glucose stored mainly in the liver). If your blood glucose is high, the insulin secretion is increased consequently. The bad thing in here is that insulin is the only hormone which is reducing the amount of blood sugar in plasma. Furthermore, the organism requires time for the insulin secretion and the insulin needs time to lower your blood glucose level. That is the reason why you have an elevation of the blood glucose in a period of two hours after having a meal. That is also the reason why you are not supposed to eat before the blood test. If there was some kind of abnormality in your glucose metabolism, the blood sugar in 7:30 will be about 200-250 and, after having a meal it is going to be 300 mg/dl. In purpose to be sure that you are not having diabetes, there is a test for impaired glucose tolerance. This test is providing you a diagram of your blood glucose values during the whole day. This will make you see that everything is ok with your glucose metabolism. This test is estimated in every hospital by every doctor who is endocrinologist.